Probably the most colorful and controversial of all the American military commanders in World War II was General Douglas Macarthur. ■ Reeling from the sledgehammer blows dealt U.S. forces in the Pacific right after the Pearl Harbor attack, General MacArthur rallied his forces in Australia and led the long road back to Tokyo and Japanese surrender. ■ MacArthur traced his ancestry back to the Strathmore Valley in Scotland. He was born in Little Rock, Arkansas, and reared in the military tradition. His father Arthur was a career officer. At 20, he commanded a division as a colonel in the Union forces in the Civil War. Douglas was graduated first in the class of 1903 at West Point. During World War I, he commanded the Rainbow Division. He was head of West Point (1919-22). In 1930 he became U.S. Army Chief of Staff and served five years. 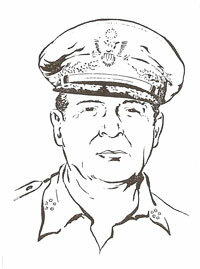 MacArthur retired December 31, 1937, but was recalled to service in the Philippines when tensions rose in the Pacific and the outbreak of war seemed imminent. ■ When the Japanese struck, General MacArthur�s forces were badly outnumbered and he was forced to retreat to Bataan and Corregidor from which he was rescued by submarine and taken to Australia to organize the assault on Japan. Five years later Macarthur accepted the Japanese surrender and served as military governor of Japan for five years. During the Korean War, he became embroiled in controversy with President Truman who forced him to resign his command in a dramatic confrontation. ■ MacArthur made a memorable speech before Congress explaining and defending his policies. He retired to private life with the highest Army rank, General of the Army. He died April 5, 1964, in Washington.